What's New for the 2018 Lincoln Continental? Luxury sedans take the basic features of typical sedans like a separate storage trunk and space for five riders and turn it into an experience of pure pleasure. 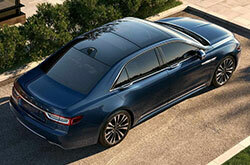 The Lincoln Continental has been a cornerstone of this category since 1939 that even US presidents have counted on. With its return in 2017, the 2018 Lincoln Continental marks the second year for buyers to enjoy this icon redesigned with all the latest advances the 21st century has to offer. With three models to choose from, the Premiere, Select, and Reserve, the 2018 Lincoln Continental runs the course from luxurious to just plain opulent. Physically, with 39.3 inches of headroom and 44.4 inches of legroom up front, it's nearly impossible for anyone to feel cramped in the Continental's cabin. It's the same story in the second row with 37.7 inches of headroom and 41.3 inches of legroom. All models outfit this voluminous space with standards like active noise cancellation, three 12v power outlets, an 8-inch digital touchscreen, remote start, push button transmission, and wood trim and leather-wrapped steering wheel for the expected aesthetic experience. At the individual trim level, the introductory Premiere model comes with an AM/FM/MP3 music system with optional CD supported by 10 speakers and USB connectivity, dual-zone climate control, and 10-way power heated front seats. The Select edition adds to these comforts with leather upholstery, a 110v outlet, two extra USB ports for second row commuters, and hands-free trunk access. 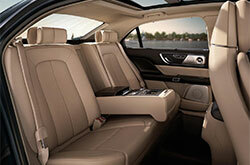 It also has the option of 13 speakers, an auto-dimming rearview mirror, and 24-way power heated and cooled front seats. With the Reserve model, 24 seat positions become standard along with tri-zone climate control. 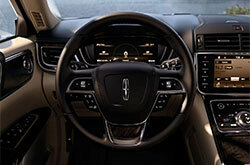 It also provides the option of a 19-speaker Revel audio system. A substantial vehicle demands a substantial engine to make smooth acceleration and maneuvering a reality. With the Continental, there are three power plants that easily achieve these goals. 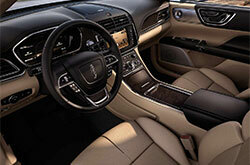 Basic operations are handled by a 3.7 liter V6 that supplies 305 solid horses with 280 lb-ft of torque. Attached to a 6-speed automatic transmission that accompanies all engine selections, this block provides 17 mpg city and 26 mpg highway. The 2.7 liter turbocharged V6 alternative increases both strength and mileage. Generating 335 horsepower and 380 lb-ft of torque, this machine also boosts fuel savings to 18 mpg* city and 27 mpg* highway. Maximum brawn of 400 horsepower and 400 lb-ft of torque is produced by the 3 liter turbocharged V6 that comes as an option in the higher trims. Paddle shifters are included to allow the driver more control over applying the gears. Taking things even further, the 2018 Lincoln Continental offers the option of dynamic torque vectoring. This feature found in four-wheel drive versions partially applies rear brakes when rounding tight corners for a smoother ride. The 2018 Lincoln Continental possesses an imposing demeanor that translates into exceptional safety ratings of Good across the board from the Insurance Institute for Highway Safety. 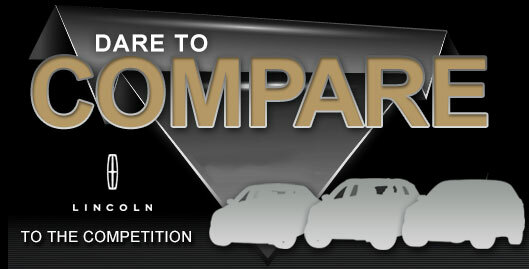 Similar results come from the NHTSA with an overall score of 5 stars. Helping the Continental reach these marks are stock features like anti lock brakes, traction and stability control, airbags, hill start assist, and a rearview camera. At low speeds, the Continental can also detect obstacles ahead or behind the vehicle through ultrasound and give warning. High-tech add-ons like front collision warning with pedestrian detection and automatic braking and blind spot alert come standard or optional on higher trims.